258 pages | 6 B/W Illus. 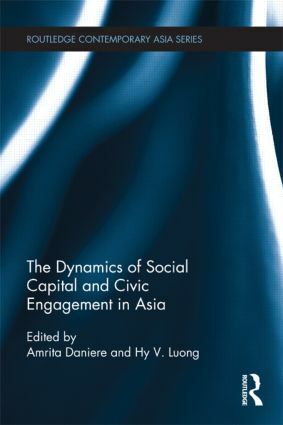 The purpose of this volume is to highlight the impacts on civic engagement of social capital, and its various component parts (trust, norms, networks and associations), in diverse parts of Asia. Addressing the pressing need for improved governance within the spatial, political and cultural realities in the rapidly transforming landscapes of Asia, the contributors to the book bring together interdisciplinary work that focuses on the ways in which civic engagement can link with social capital building. The goal of this volume is to inspire policy that recognizes that a vibrant society with access to rich stores of positive social capital requires civil society, alternate civilities and the state. The result is a dialogue on the interplay of social capital and civic engagement in socio-political contexts quite different from those found in the West. This book contributes to current discussions about the nature of social relations and their connection to politics and change and offers a unique lens into the validity of these important concepts in contemporary research across a variety of Asian settings. It will be of interest to social scientists across the board, especially those with an interest in Asia and Asian development. Amrita G. Daniere is Professor of Planning and Geography at the University of Toronto, Canada. Hy V. Luong is Professor of Anthropology at the University of Toronto, Canada.